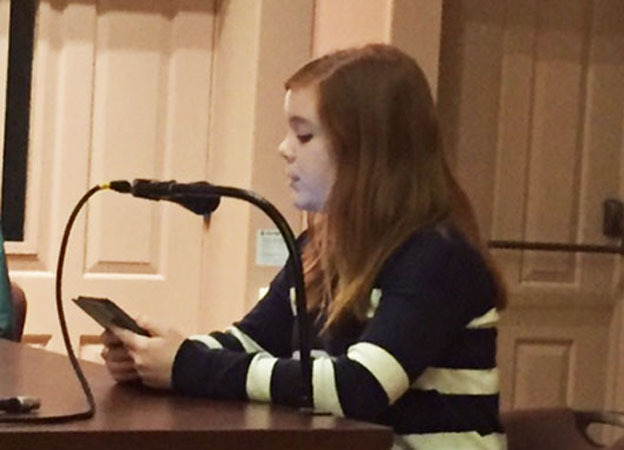 Student Representative Bridget Carl presented the following report at the School Committee Meeting June 22, 2016. It was was her final report of this school year. Bridget has been re-elected as student representative for the 2016-2017 and looks forward to continuing in her role. These last two weeks have been filled with some great experiences for the students at Forestdale. It began with our last “Town Hall Meeting” of the year. In our Town Hall meetings all the students in the school gather using a Responsive Classroom Morning Meeting format. The students greet each other and share out about what they have learned in the past month. Our kindergarten students led this last Town Hall Meeting and shared what they had learned this year in song. On June 14th the students enjoyed a fabulous day of activities. Each grade participated in Flag Day celebrations filled with songs, poems and interesting facts about the flag. Several of our School Committee members came to share their thoughts about the Flag and what it meant to them. Additionally on the 14th, we had our first Field Day as a newly configured school. The students rotated through ten different stations where they participated in traditional field day activities like tug of war, sack races and the egg and spoon race. The students were also treated to face painting by several of our Sandwich High School students and popsicles provided by the PTA. Lastly, today grade two students participated in the first Grade Two Send Off. Parents were invited to a small ceremony in the gymnasium where students sung songs, shared experiences from the year and watched a slideshow of pictures from the year. At Oak Ridge, students enjoyed trips to the salt marsh, Heritage Museum/adventure park and historic sites in Sandwich. Today we wished our six graders the best as they celebrated their move up to STEM. The 7th grade visited the Cape Cod National Seashore in Eastham last Friday and learned about the natural and cultural resources of the Cape. The 8th grade end of the year celebration including their video My Three Words will be held Thursday, June 23 from 9-11 in the school auditorium. Parents are invited. There are 22 STEM Academy students who will be attending the Advanced Studies and Leadership Program at the Massachusetts Maritime Academy this summer beginning Sunday, June 26. Congratulations to these students for their high achievement. Field day was a big success again this year and the STEM students participated in many activities and games led by high school peer leaders. Welcome Night for incoming 7th graders is scheduled for August 29 at 7:00 PM. The students will receive their schedules and visit their classrooms. Thank you to the STEM Parents Group for their help with end of the year activities and for the breakfast for STEM teachers and staff. the 2015-2016 school year was outstanding. Sandwich High School achieved Level One status. Students were accepted into some of the top colleges int he country. 90% of the graduating class is going on to higher education. Sandwich Soul achieved national recognition. Sports teams excelled and life in the castle was enhanced by the joy of learning and daily energy of our STEM- mates. We are already looking ahead to the leadership of the exceptional Class of 2017!